Deluxe high-gloss tip-on album jacket Relaxin’ with the Miles Davis Quintet is in every way a masterpiece. When Davis the trumpeter (1926-1991) had formed the band in 1955, his colleagues — tenor saxophonist John Coltrane, pianist Red Garland, bassist Paul Chambers, and drummer Philly Joe Jones — were not considered jazz-world A-listers. Davis had seen his once-promising career go into eclipse. By 1956, however, his sound, especially when muted, was an achingly personal counterpart to the vocals of Billie Holiday and Frank Sinatra. 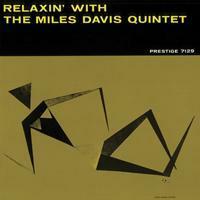 Relaxin’ (plus its Prestige companions, Miles, Cookin’, Workin’, and Steamin’) reestablished Davis, and elevated his quintet as the gold standard of small groups. This set is called Relaxin’ because of the ballad performances in several different bright tempos. From medium-bounce to crisply up, Relaxin’ remains one of Davis’s sunniest outings, a prime example of one of the outstanding ensembles of the 20th century reaching the summit of their artistry. The second to be issued in the classic series of Davis quintet LPs in the mid-1950s, this is yet another helping of that quintessential group's output from one day's marathon recording session. It demonstrates Miles' mastery with a mute (he only plays open on Dizzy Gillespie's "Woody'n You"), the emerging talent of the young John Coltrane, and the subtlety and strength of the rhythm section, headed by pianist Red Garland. As with the other titles, Relaxin' contains a variety of material which the band had concurrently been performing in their concert appearances. In a brilliant stroke of time conservation, the scheme was hatched for the quintet -- who includes: Davis (trumpet), John Coltrane (tenor sax), Philly Joe Jones (drums), and Red Garland (piano) -- to perform the equivalent of their live repertoire in the studio for eventual release. The results are consistently superior both in terms of song selection as well as performance. The solid nature of the unit as a singular musical force is immediately apparent. "If I Were a Bell" -- from the play Guys and Dolls -- includes some remarkable soloing via Coltrane and Garland. Davis' solos are additionally impressive, as they're derived from the same four-note motive as the melody. Hearing the many variations that he comes up with throughout the song conveys how intrigued Davis must have been by the tune, as it stayed in his performance repertoire for decades. Tracks such as "You're My Everything" and "Oleo" highlight the synchronic nature of Davis and Coltrane as they carry each other's melodies while trading off solos. The steady syncopation of Philly Joe Jones keeps the rhythms tight and the delicate interplay all the more conspicuous. Relaxin' offers something for every degree of jazz enthusiast. Likewise, the quintet's recordings provide a tremendous introduction for the curious jazz consumer. Recording engineered by Rudy Van Gelder.